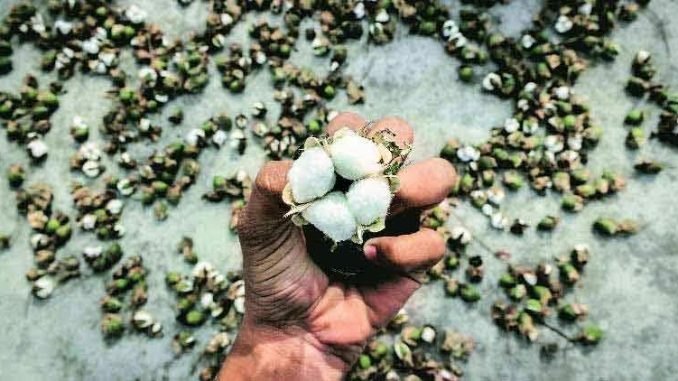 NAGPUR: Farmers in Maharashtra’s Yavatmal district have reported the illegal sale of seeds, and cultivation, of a genetically modified (GM) cotton variant not yet approved for use in India. Monsanto, the seed giant, was to release Bt cotton of the ‘Bollgard III (BG-III)’ variant — with an additional gene as compared to the one introduced in 2010, and the purported advantage of killing weeds as well as pests — in India about six months ago. But it withdrew its decision considering the anti-GM atmosphere in the country. It may now officially come to India in 2020. According to sources, BG-III was brought to Yavatmal from Andhra Pradesh and Gujarat. A Yavatmal farmer, K K Patil, told TOI that traders from Gujarat sold the seeds by sending local unemployed youths to farmers’ homes from April to June. The exercise was conducted during night hours, he added. “About 5.5 lakh packets reached the district during this period. The youth were given a commission per packet. The seeds have been cultivated at least in 2.5 lakh hectares. They sell these seeds by labelling them with the name of the variety a farmer demands. The farmer is unaware of the actual variety he has grown. The packets were sold at Rs 800 to Rs1,200 per 450g,” said Patil. Kishor Tiwari, the chairman of the Vasantrao Naik Sheti Swavlamban Mission (VNSS), Maharashtra’s task force for farm distress, claims that as many as 10 lakh hectares had been cultivated with BG-III, adding that this had led to a spurt in attacks from all types of pests. “The government has completely failed to regulate the agriculture policies,” he said. It was Tiwari who informed the agriculture department about the illegal cultivation of BG-III in Yavatmal. S S Jadhav, the director (extension) of Maharashtra agriculture department from Pune, told TOI, “Tiwari told us about the issue on Friday. We can’t test the presence of the gene now as the plant has reached the third stage of growth,” he said. Reportedly, the Indian Council of Agricultural Research (ICAR) was aware of the illegal use by farmers. It had directed the Nagpurbased Central Institute of Cotton Research (CICR) to test the cotton crops for the presence of BG-III about a week ago. CICR director VN Waghmare told TOI that it may not be possible for the institute to do this exercise on a large scale but “we can train the state agriculture.